Indoor plants always look great when we see them for sale. They can however become a little tatty looking if not given the proper care. Some indoor plants are actually grown as short term plants, the classic example is the Poinsettia, a display over the festive season is what most people expect. How to grow Indoor Plants. For long term indoor plant success you do need to look a light, moisture and humidity requirements for individual species. So explore the world of indoor plants, read the notes on specific plants, check that information on the label is adequate and if you follow the instructions and advice you should have success. Commence with light, plants have different light requirements. 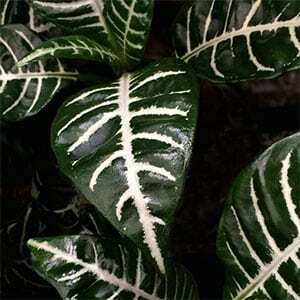 Low Light Plants – These need to be away from strong direct light, usually around 2 metres from a window. Medium Light Plants – These need to receive only filtered direct light. High Light Plants – They need to be close to good strong light. This is a starting point. You also need to consider watering requirements, humidity and potting mix. Choose the right combination for the right plant. In terms of care these plants are really individuals, once you understand the needs of specific species you will find that most plants can be grown indoors. Great looking plants are good for your health as well. It has been known for a long time that indoor plants can help improve air quality, and as far back as the Victorian era indoor plants have been popular for aesthetic reasons as well. Indoor plants are not only known to help filter air and remove impurities, but they also provide a calming effect which can help with mental stresses of everyday life. The air indoors not only carries the impurities of that outdoors but also those released by the volatile oils and vapours released by paints, floor coatings, furniture and in fact just about everything that we bring into our homes. 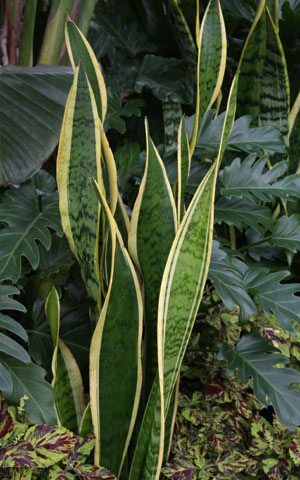 Indoor Plants such Sansevieria trifasciata, make a dramatic statement with bold foliage So how do indoor plants improve air quality ? Simply by the very nature of plants themselves, they absorb pollutants through the foliage and the bacteria in the growing medium convert them later on. A few studies by NASA and Universities around the world have proved this. This is going to depend on your own preferences however over the years a few have proved themselves as winners. Most of these grow well in low light, and that is part of what makes them easier to grow than others. They like the filtered light provided indoors and flower as well. Again they grow well in filtered light and these require little care. These slow growing palm trees are widely used in shopping centres and offices. Zamioculcas zamiifolia, also known as Zanzibar Gem. It is as tough as old boots and will survive while you are on your holidays. These do take a little care, however the wonderful flowers make them real treasures. Orchids are great indoor plants, if you are really interested perhaps and Orchidarium is a good idea. The ‘Cast Iron Plant is Aspidistra elatior’, it is just so tough it deserves its name, it will almost grow in the dark with no water, easy as an indoor plant. Another tough indoor plant, one of the best. Given the right conditions Hippeastrum can be a spectacular indoor plant when in flower. Maidehair ferns (Adiantum species) are a favourite, however many ferns including Birds Nest Ferns, Tree Ferns and Elkhorns will grow well indoors. Like all plants some are hardy and others take a degree of car e, similarly, indoor plants require varying degrees of light to grow and flower successfully. So hardy indoor plants will require varied conditions, and this will depend not only on the plant, but also the climate. In cold climates where heating is on and the air tends to dry out, a different set of conditions are presented to a tropical climate. Three of the hardiest plants for indoors are Aspidistra, Sansevieria and the ZZ plant. Almost impossible kill. Do indoor plants make you happy? If you take a walk from a city street into a garden, most people feel more relaxed, plants seem to relieve stress, and we are not sure why, but we do find them relaxing both indoors and out. So what are the best plants for indoors. Philodendron bipinnatifidum and Monstera deliciosa (often confused) have been grown indoors since the Victorian era, so they have a proven record. Aphelandra squarrosa, also called the Zebra Plant, a little more difficult than some, however great foliage and amazing yellow flowers. A long time favourite indoor plant and a great hobby for many. It is possible to hire plants, and maintenace is also available. In commercial situations hiring seems to be the most practical method. If you are considering which pots or planters to use, consider the range of lightweight garden pots that allow easy movement to outdoor areas when required. Also consider drip trays, essential with any indoor plant. You can buy a good range of Indoor Plants at the Following Nurseries and Florists.